We are delighted to be sponsoring Commercial Payments International’s (CPI) annual Europe Summit again. 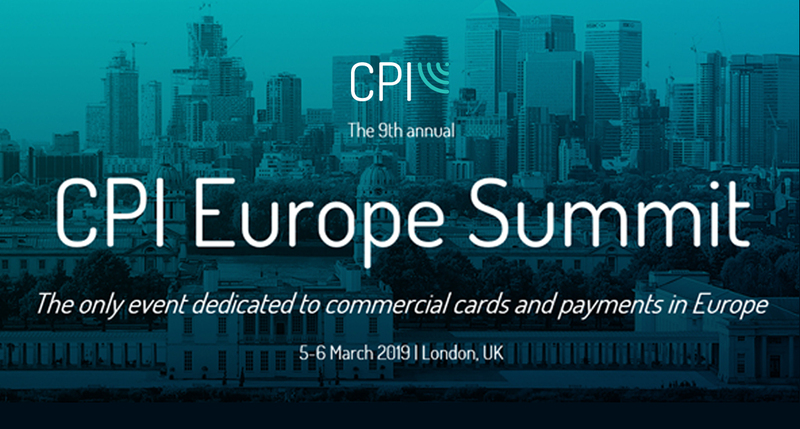 Now in its 9th year and scheduled to take place between 5-6 March 2019 at the Hilton Canary Wharf in London, CPI is the only event in Europe dedicated solely to the commercial cards and payments industry. Hear from our Chief Commercial Officer, Henry Pooley, as he presents and hosts a Think Tank breakout session on ‘Tackling Small and Mid-size Enterprise (SME) Challenges’. Henry will be exploring the huge growth opportunity SMEs provide to the commercial banking industry, touching upon the needs and pain points of the SME market, and stimulating audience conversation on the ways in which banks can address these challenges. So, what else is on the agenda at this year’s event? Aside from the exciting event agenda, CPI provides a great opportunity to network with over 165 senior level professionals from the commercial cards and payments industry. Amongst those, our team will be on hand throughout the event and we encourage attendees to stop by our stand, say hello and continue the conversation. To learn more about the CPI Europe Summit and to register for tickets, visit the CPI website and use our code FRAE/DC to get 20% off.